Do me a favor, bookmark this post now. You'll thank me later, and I'll tell you why a couple paragraphs down. Got it in your bookmarks? Here's a handy guide in case you're unsure how to do that. Good. Let's get into it. If you're anxious about the Subway system and need some guidance, I share tips and tricks for first comers in this post. 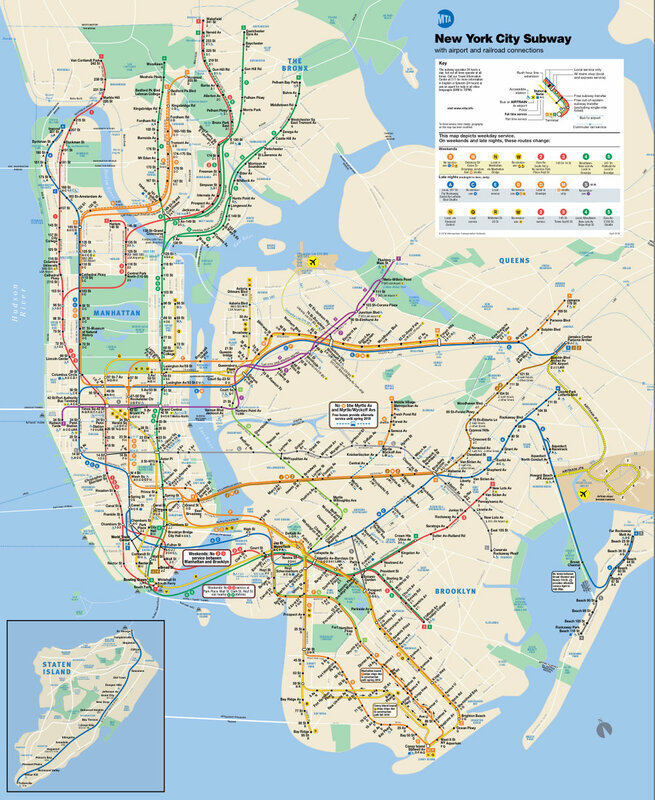 After you read this post, you should feel ready and willing to explore all that the New York City Subway system has to offer! And you'll be privy to some of the secrets, like the bronze figures at the 14th Street and 8th Avenue station. When you first enter the subway, depending on the station, you could find yourself overwhelmed by the options of paths, so I made this guide about the best ways to navigate the subway. I enjoy figuring out chaotic situations on the fly. It's why I quit college to go into this whole business in the first place! I have imbibed this post with that passion. Here is a link to a more detailed version of the Subway map: http://austin.realestatewealthexpo.com/austin-2018#tickets. Download that using whatever you will have with you on the subway. ...Google Maps gives you Subway transit directions. I have countless times missed a train, absentmindedly gone on the wrong subway, or in the wrong direction, or mixed up names of stops, or miscounted... You will, guaranteed, miss a stop at least once, and probably more like 5 times, during your trip. Most stops have either no reception or spotty reception, and in the Subway tunnels, there is no shot for even a bar of signal. You need to have a saved image on your phone, tablet, or laptop, shaving precious seconds off your sprint to the map on the end of each train car. I might have saved you a trip into a dark alley, with a creepy dude with a bloody shovel waiting to dig you an early grave! Or a trip to the wrong side of NYC, in case you confused 103 Street Station, just west of Central Park on the 1, 2, 3 line, 103 Street Station just east of Central Park on the 4, 5, 6 line, and 103 Street Station near Corolla on the 7 line just south of LaGuardia Airport. I travel alone most of the time. At times I have to lug my luggage all over the city from one host to the next. The larger stations in Central and Lower Manhattan (any 34th Street station, 42nd Street Times Square, and numerous others in busy areas with transfers) have elevators you can use if you're wheelchair-bound or have tons of luggage. Because, you know, you're traveling. Why else would you read this post? A quick sub-tip: The elevator button lights do not stay on when you push a floor... But they are working! Press the "close door" button to speed it up if you need to. Since I travel alone quite often, in the fringe stations where there are no elevators, I still need to move my luggage. My luggage is still with me, it didn't mysteriously disappear! I have found that politely asking a stranger to help carry my bags works consistently. While New Yorkers have the reputation of being self-absorbed assholes (and some live up to that reputation) most will help you with your luggage if you ask politely. If someone looks cute or interesting, TALK TO THEM! When I travel, I travel socially. I make sure I speak to everyone I want to meet. If someone is selling some cool art, I say hi! Many people are too scared to talk to strangers in fear of being rejected. No problem, there is no shame in having anxieties. Here's a great link to a visual easy-to-read and understand article on Overcoming Social Anxiety: Article Here. "Travel is the perfect place to overcome social anxiety. You can face your fears without any lasting social repercussions for being extremely awkward or impolite, and learn to realize it's all just fear. The next week, you'll be on the other side of the world, so who cares what they think of you? Use that to overcome your anxieties." These social skills will transfer to your home, or your next travel destination if you're a nomad. You'll be able to be more charismatic, more polarizing, more interesting of a conversationalist because of the practice you had while traveling. As I stated in other posts, like this one and this one, I am used to travel. I moved around so much as a kid, it felt like I was on the road. The road was my home, so I naturally had very little social anxieties (although I was quite disconnected socially, so on the other end of the spectrum there were issues to work out.) I have found the reason for my innate ability to converse with people, much easily than I saw others converse, was my constant experience of traveling alone. When I was 11, my mom sent me and my brother (15 at the time) to the airport to fly across the country to my grandparents' on our own. This became a regular thing. When I was 15 my mom put me in a private high school. I had to commute on my own, 80 miles each way, coordinating a bike ride to the train station, a BART (California's Bay Area Rapid Transit, San Fran's metro system) ride to a local bus stop, and a bus ride to the school. So naturally I developed the skills to create social fulfillment anywhere and easily overcame social anxiety. Take the opportunity on the NYC Subway System and do the same! "Emergency Exit?" Nah, with suitcases, plow through that. When entering and exiting a subway turnstile, luggage easily gets caught. And picking it up and carrying it over can jostle all your stuff! All Subways have a service door for passengers with disabilities, and you, as a traveler encumbered with luggage, are also welcome to use it. Welcome to the disabled. When entering the subway, place your suitcase outside the door and alert the resident station-manager first if there is a booth. Enter the station like normal (swipe your card, turn the metal thingy (I have no idea what that's called, and I feel overly posh using "turnstile") and open the door from the other side, retrieving your suitcase. Even though the door says "Emergency Exit, Alarm Will Sound," it is commonplace to use these doors. I have done this many times, and have seen other passengers do it twice that amount, with no alarm. I will personally mail you a $2 bill if you show me video of an alarm ringing as a result of you using an NYC Subway service door. Just email a youtube link, personal-written account, and US mailing address to ProjectUnchained@gmail.com and I will send out a $2 bill and issue a public apology on this blog. Some stations will be close enough to the surface to have good cell phone coverage. Other stations have a WiFi system installed. But for all intents and purposes, assume you've been placed in a Faraday cage once you step down the first staircase. This means anything you need to do which needs an internet connection... Do BEFORE you enter the station. Sending texts, messages, updates on location or eta... etc. Or closing times of the museum etc. Do that all before you swipe your card. You'll likely spend a max of 7 minutes and 23 seconds at the station, after which you'll be completely underground in the tunnels without coverage or transit WiFi. 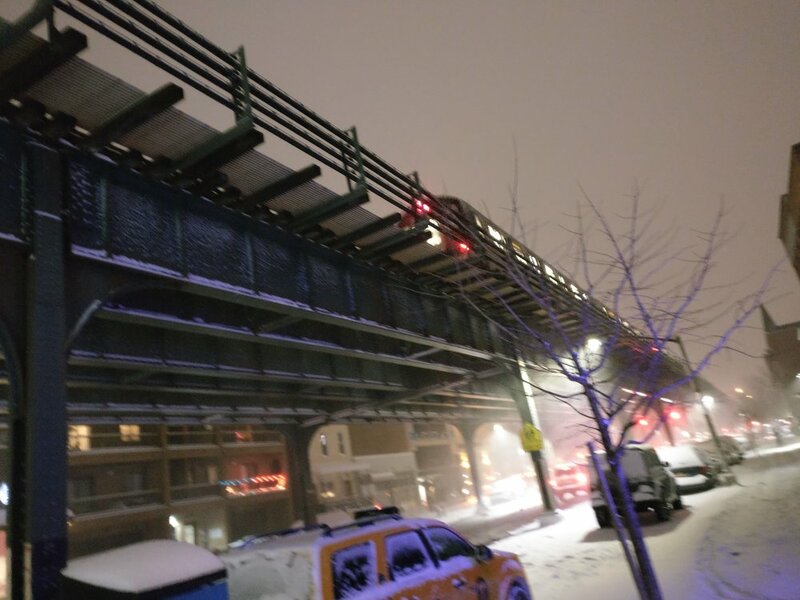 Even in Astoria, where the Subway is above ground, coverage can still be spotty and should not be relied upon. But the reality is, the subway is a safe place. Don't instigate anyone and you'll be fine. ... flash performers in Brooklyn who come on the train, sing, and ask for money. They're really good, don't feel like you have to, but if you're feeling generous give a dollar. And art installations like this one at the 14th Street - 8th Avenue station. Feast your eyes on this gallery of pictures I took over the last week in preparation for this post. If you have any iconic Subway stories, great tips or questions, put them in the comments!